Xiaomi Mi Mix 3 is a great-looking smartphone - that's for sure. But the thing you'll spend the most time looking at is the 6.39" Super AMOLED screen. Notch-less. Bezel-less. Yes, it's all that - at least by the most current industry standards. Anyway, the OLED screen has an expanded 1080p resolution - meaning 1,080 x 2,340 pixels or 403 ppi. The screen aspect ratio is 19.5:9 - among the widest, the mobile market has to offer today. While this is not the highest resolution we've encountered, at 403ppi the screen is as sharp as a flagship needs to be. And the pixels density is high enough for the PenTile matrix to be unnoticeable for the naked eye. 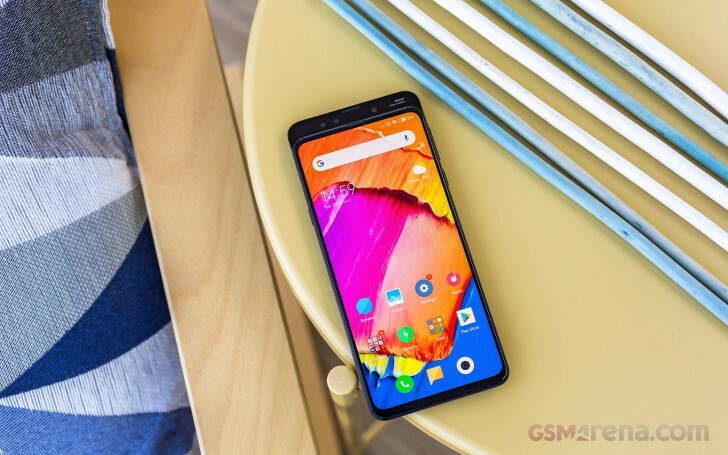 Xiaomi is promising 430 nits of typical and 600 nits of maximum brightness for the Mix 3 screen. And we can confirm those numbers - we measured 445 nits of brightness at the far right of the brightness scrubber and 2.1 nits at the far left. The screen can also achieve 633 nits on Auto mode when the ambient light is bright enough. There is no light bleed - when the screen is showing black it's not lit at all. In our sunlight legibility test, the Mi Mix 3 posted a respectable score for contrast, towards the top for its class. Color reproduction can be very accurate if that's your thing. Going for the 'Standard contrast' mode you'd be getting an average DeltaE of 2.3 (when compared against the sRGB color space) and the most accurate whites of all modes. Out of the box, the Mi Mix is in 'Automatic contrast' mode. That corresponds to DCI-P3 colors space and gives an average DeltaE of 4.5 - decent - but with an added blue tint in white and all shades of gray. The Xiaomi Mi Mix 3 is powered by a 3,200 mAh Li-ion battery. It's not the largest by any means, but that's not always as important. The Mix 3 supports Quick Charge 3.0 and 4.0+ and its supplied 18W charger fills 54% of a depleted battery in 30 mins. The Mix 3 also comes bundled with a 10W wireless charger, which can replenish 0 to 32% in half an hour - really impressive! The charger is rather small and has a soft finish that is really nice on touch. The pad gets a bit warm during the first stages of charging, but it's nothing really worrying. We ran our battery tests, and the Mi Mix 3 posted an overall score of 84 hours. That's a huge improvement over the Mi Mix 2 and 2S, and about as much as the Mi 8 got - all three of them running on the same Snapdragon 845 chip and powered by 3,400 mAh batteries. The Mix 3 actually did great in our screen-on-tests - the web and video playback times are impressive for a screen of this caliber, while the 3G talk time is more than enough. The standby performance is about the average, though, and it's what stopped the final endurance rating from going north of the 100 hours mark. Our battery tests were automated thanks to SmartViser, using its viSer App. 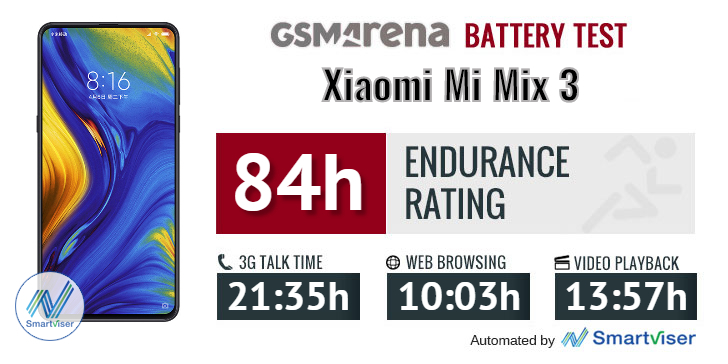 The endurance rating above denotes how long a single battery charge will last you if you use the Xiaomi Mi Mix 3 for an hour each of telephony, web browsing, and video playback daily. We've established this usage pattern so that our battery results are comparable across devices in the most common day-to-day tasks. The battery testing procedure is described in detail in case you're interested in the nitty-gritty. You can check out our complete battery test table, where you can see how all of the smartphones we've tested will compare under your own typical use. There's a single bottom-firing loudspeaker on the Mi Mix 3 - it's decently loud and scored a Good mark on our test. The output is excellent - there is rich sound and no distortion. Xiaomi Mi Mix 3 did excellently when plugged into an active external amplifier, delivering perfectly accurate audio reproduction and volume levels well above average. Headphones didn’t cause too much damage - volume dropped a tiny bit but remained in the upper half of tested phones, while the hike in stereo crosstalk was also lower than average. There’s a tiny bit of intermodulation distortion here too, but nothing to worry about. A solid if not necessarily chart-topping performance.